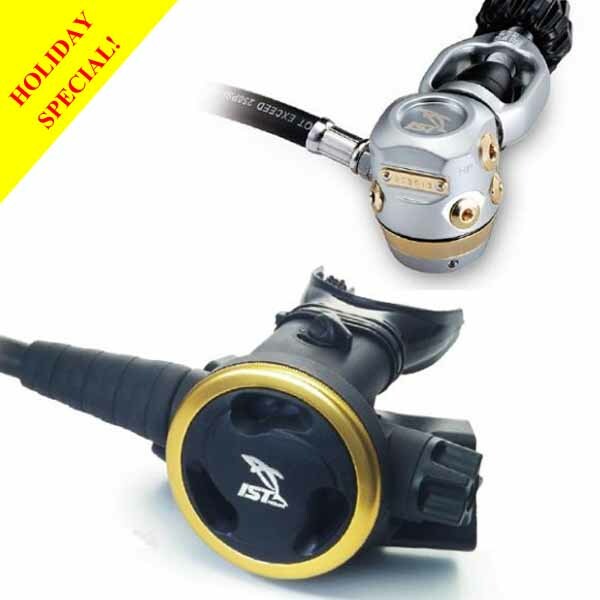 The new R-410 regulator has all the performance and style that a diver needs. The R4 first stage utilised the well proven balanced diaphragm design to satisfy even the most demanding diver. Along with our award winning second stage, this combination is unbeatable. • New balanced diaphragm design with outstanding flow characteristics. The intermediate pressure drop is kept to a minimum even with heavy flow demand. • 2 fixed high pressure ports and 4 angled low pressure ports for better hose routing. • R-4 is capable of keeping intermediate pressure steady and remains virtually unaffected by depth or remnant tank pressure. • Available in 232BAR yoke or 300 BAR DIN connector. • All Condition environmental seal (on R-410/N) protects the first stage's main spring from slit, harmful contaminant and especially the extreme cold. • Air is the medium used in All Condition environmental seal as it is the best insulator; the sensitivity of the regulator, however, is not affected with IST's direct pressure actuation design. • Equipped with NEW energy-saving hypoallergenic silicone mouthpiece with long tabs spreading the biting force more evenly!